The Beetal Breed of goat is also considered as the very profitable breed to raise in the commercial goat farm. This breed has very good milk yielding capability after Jamunapari. The Beetal goat is the large animal and considered as the dairy goat breed. There skin are of very good quality for making leather goods which has demand in the market. Beetal goat is more adaptable to the different climatic condition and also suitable for the stall feed system. Beetal goat is the breed of Punjab and Haryana region of India and Pakistan also called as Amritsari goat. However true breed of Beetal is found in the Amritsar, Gurdaspur and Ferozpur district of Punjab. Beetal is the large animal with an average male body weight of 45-50 kg. It is found in brown or black with various round white spot in the body. Though the majority of Beetal goats are black in color among them the brown Beetal percentage is less as compare to the black beetal. Its a true resemblance of the Jamunapari goat with convex face and Roman nose. They too have drooping ears which is long and flat both male and female have thick horn of medium size. Beetal goat has small tail and there udders are well developed with perfect conical teats which makes them a true dairy goat breed. The average body weight of adult male and female are of 55 and 35 kg respectively. Hence they are considered as the large animal with such a huge body weight. This breed is also well suited with the stall feeding system and shows very positive growth result with the proper feed supplied to them. Beetal goat is also very reproductive the average age at first kidding is approx 2 years and at the interval of 12 months.kids percentage is of singles which is of 40% and twins is of 52% also triplets with 7% and sometime quadruplets which is very rare 0.5%. kids are born healthy with an average weight of 2.8 – 3 kg and gains 12 kg of weight in 6 months and 22 kg in 12 months. Milk yield is very good with an average of 180 litres in there lactation period of 185 days hence they are also considered as the dairy goat breed. Milk yield is quite enough for the feeding kid which is very essential to reduce the kid mortality rate. There overall performance is good in every respect though it is meat, milk and leather. 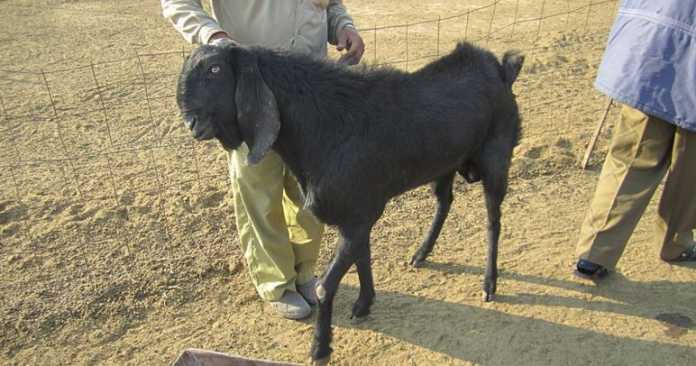 Hence this breed is also suggested for the commercial goat farm however it is advised to have cross breed with Beetal buck with the regional goat breed to have better cross breed result. They show very good result with the stall feed condition hence it is advised as the profitable goat breed for commercial goat farming.